Huey Long expanded the public education system in Louisiana and made it possible for every child to attend school. His administration established a public school in every community and provided free textbooks and busing to all students. He made higher education possible for thousands of high school graduates by expanding Louisiana State University and establishing scholarships. 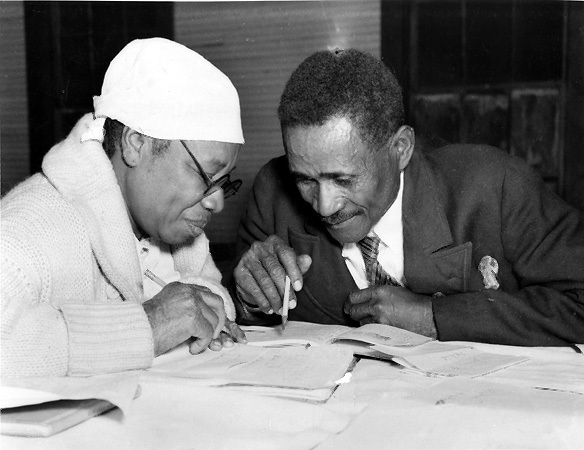 He initiated a massive adult literacy program, teaching 100,000 adults to read. 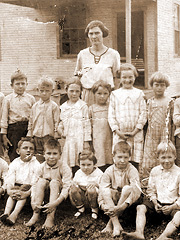 Teacher and students outside their one-room schoolhouse. Many poor families had to choose between buying their children shoes or school books. Huey Long championed the idea that education is every child’s birthright and restructured the tax system to shift the financial burden of education from poor families and parishes to the state. 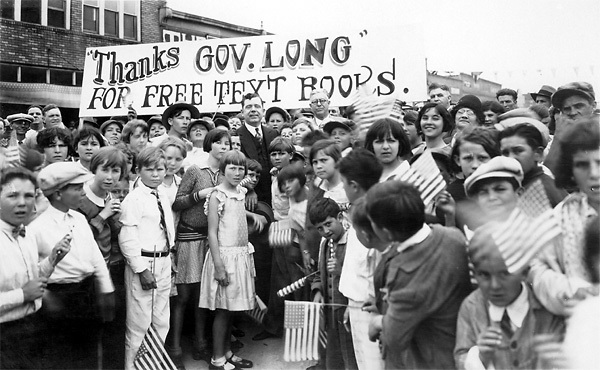 Upon taking office, Long pushed a bill through the legislature to provide free textbooks to every Louisiana student. Opponents resisted the measure, stating that the proud families of Louisiana should not be forced to accept charity from the state. They also opposed Long’s plan to finance the program with a tax on oil production. With free textbooks, school enrollment instantly increased 20 percent. Huey Long's adult literacy program taught 100,000 Louisianians to read. Long’s education initiatives built new public schools and provided free busing to ensure all students could attend school. He established adult vocational schools and night classes that taught 100,000 of the state’s 238,000 illiterate adults to read by 1932. Long promoted higher education by expanding Louisiana State University and lowering the cost to attend. Despite the Depression, enrollment at LSU tripled by 1936, and it quickly became one of the finest universities in the South. Thousands of young adults who previously would have followed in their parents’ footsteps, by eking out a living on the farm, had the opportunity to chart their own careers. 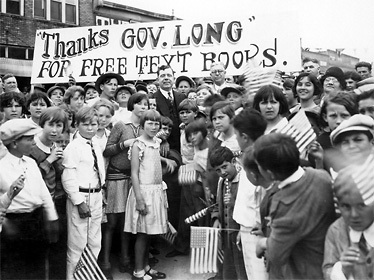 Children thank Huey Long for the free text books provided by his administration. 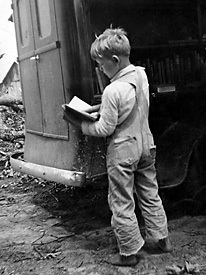 A child from Winn Parish, La., visits the bookmobile in 1938. 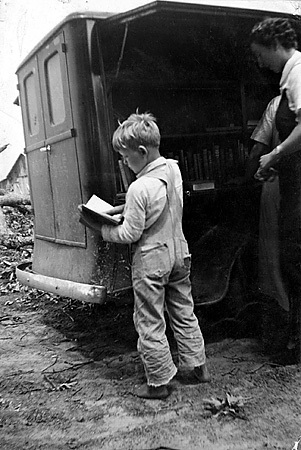 Books were rare in rural parishes until Huey Long's statewide initiatives to educate the rural poor. 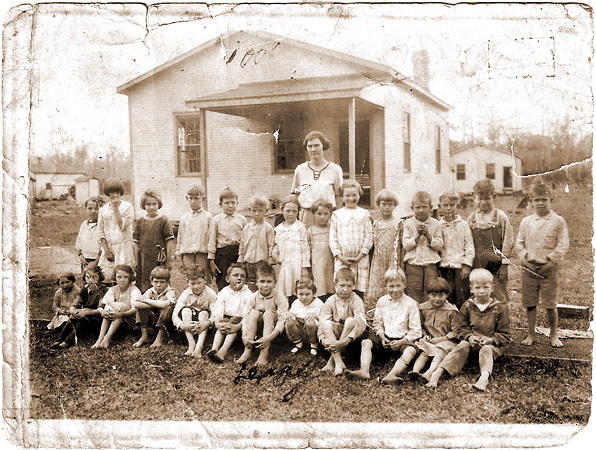 In 1920s Louisiana, education was not readily available – or affordable – for many families. Public schools in rural areas were few and far between. Families were required to purchase their children’s textbooks, an expense that much of the rural poor were unable to afford. 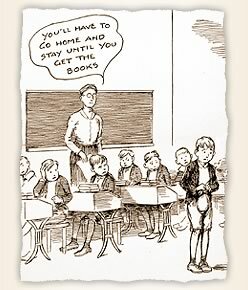 Children without textbooks were sent home. 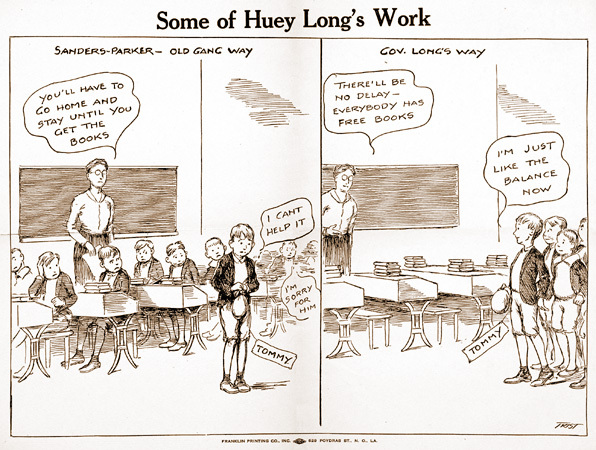 A cartoon from Huey Long's Louisiana Progress newspaper depicts how children were sent home if they did not have the required text books. Louisiana’s literacy rate, a measure of a state’s social progress, was the lowest in the nation. One in four adults could not read – or teach their children to read. One in seven white male farmers had never attended school, and half of those who had attended never reached beyond the fourth grade. The statistics were worse for women and African Americans. The state’s parishes were required to provide schools, but with a struggling tax base, many could not pay teachers or keep schools open for nine months. Only children living within walking distance could attend – if they could afford the books. When the Caddo Parish School Board refused to distribute free text books to poor students — on the philosophical grounds that the proud families of Shreveport should not be forced to accept 'charity' from the state — Long withheld authorization to locate Barksdale Air Force Base in Shreveport until the children received the books.